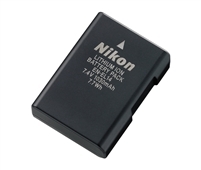 The EN-EL10 is a rechargeable Li-ion battery providing 3.7v and 740 mAh of power to select Nikon COOLPIX digital cameras. For the Nikon CoolPix S60. S80, S200, S203, S210, S220, S230, S500, S510, S520, S570, S600, S700, S3000, S4000, S5100 The EN-EL5 is a rechargeable Li-ion battery that provides 3.7v and 1100 mAh of power to select Nikon COOLPIX digital cameras. For the Nikon P80, P90, P100, P500, P510, P5000, P5100, P6000. 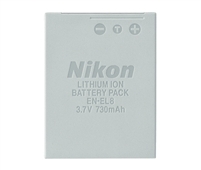 The EN-EL7 is a rechargeable Li-ion battery that provides 7.4v and 1100 mAh of power to select Nikon COOLPIX digital cameras. For Nikon 8400 and 8800. The EN-EL8 is a rechargeable Li-ion battery that provides 3.7v and 730 mAh of power to select Nikon COOLPIX digital cameras. For Nikon CoolPix S50(c) and S51(c) The EN-EL12 is a rechargeable Li-ion battery providing 3.7v and 1050 mAh of power to select Nikon COOLPIX digital cameras. For the Nikon CoolPix S800c, S70, S6000, AW110, S6100, S610, S1000pj, S9050, S8100, S6200, S8200, S630, S710, S610c, S9300, S1200pj, P300, S1100pj, S9500, S9200, AW100, S620, P310, S9400, S640. The EN-EL19 is a rechargeable Li-ion battery providing 3.7v and 700mAh of power to select Nikon COOLPIX digital cameras. For the Nikon S100, S3100, s3200, s3300, S3500, S4100, S4200, S4300, S5200, S6400. For the Nikon CoolPix P7000, P7100, P7700, P7800 and the D3100, D3200, D5100, D5200, D5300. The battery is charged using the MH-23 quick charger. For Nikon D40(x), D60, D5000. For the Nikon 1 J1, J2, J3, S1, AW1 and the CoolPix A. 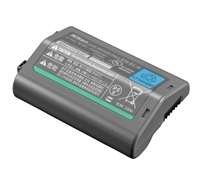 The EN-EL3e rechargeable battery provides 7.4v and 1500 mAh of extended life and consistent power to compatible Nikon D-SLRs. For the Nikon D50, D70(s), D80, D90, D100, D200, D300(s), D700 The Canon LP-E12 lithium-ion battery pack features a 7.2V output and an 875mAh capacity that's compatible with the Canon EOS M Compact System. Canon NB-6L Li-Ion Battery Pack for Canon SD770IS, SD1200IS, & D10 Digital Camera. For the Nikon D7000, D7100, D600, D610, D800(e) and the Nikon 1 V1. Canon LP-E5 Battery Pack for Rebel XTi, XS, XSi and rated at 1080mAh. The Canon LP-E8 Rechargeable Lithium-ion Battery Pack has a capacity of 1120mAh and is compatible with the Canon EOS Rebel T2i, T3i, T4i or T5i. For the Canon T3. 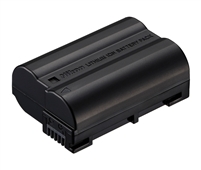 Canon NB-7L Lithium-Ion Battery Pack for Canon G10 & G11. The Canon LP-E6 rechargeable lithium-ion battery pack (7.2V), has a capacity of 1800mAh and is compatible With Canon EOS 60D EOS 7D EOS 5D Mark II and Mark III. • 3-Hour recharge time The EN-EL4a is a rechargeable Li-ion battery providing 11.1v and 2500 mAh of power to select Nikon D-SLR cameras.